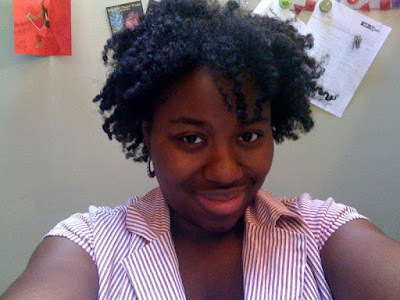 I was asked on formspring for natural hair tips. Although I have been natural (haven't had a relaxer) for 2 years, I just recently started to really delve into how to care for my hair now that I am no longer chemically treating it. A huge resource for me has been the Black Girl with Long Hair blog as well as youtube videos with styling and care techniques. The products that I am loving are those from the Carol's Daughter line. The internet is definitely the best friend of any newly naturals. Do not use products with mineral oil or petrolatum. You would be amazed by how many of the products we usually use on our hair have these in them. Mineral oil and petrolatum clog the pores, not allowing for growth, and it also coats your hair, but doesn't penetrate to actually moisturize it. Instead, use natural oils on your hair, olive oil, shea butter, jojoba oil, etc. Comb your hair with a wide tooth comb only. Combs with tiny teeth will just get tangled in your curls. Use sulfate free shampoos, or choose not to use shampoos at all, and wash your hair with conditioners or natural soaps. Cover your hair at night with a satin cap, or use satin pillow cases. Hair can get caught and break off in cotton pillow cases. Comb your hair while wet for de-tangling, and start at the ends of your hair, and work your way up to the roots. Black Girl With Long Hair is a favorite of mine too. I'm wanting to swear off pressing, but i'm having difficulty with dryness and I'm still going to a stylist until my relaxer grows completely out. I'm close to 18 months in and I recently stopped using mineral and petrolium in my hair and it has started growing again.